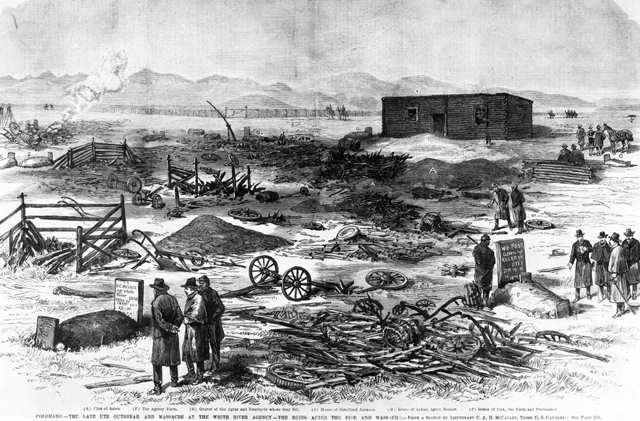 A reproduction of a sketch of soldiers surveying the damages after the fire and battle with the Ute Indians that broke out on September 29, 1879 at the White River Indian Agency. Nathan Meeker and his eight male employees were killed during the fighting, and his wife and daughter were taken hostage. Artist: Lieutenant C. A. H. McCauley, Third U. S. Cavalry. Wikimedia Commons.